From the Tuscaloosa area take 20/59 south about 30 miles to the Eutaw/Aliceville Exit 40. At the top of the ramp take a right on 14 west. Go 5 miles where you will have to turn right to remain on Hwy 14 west. If you go straight at this point you will get lost. Go 11 miles where you will see catfish ponds on your left. The Shark Tooth Creek sign and drive are on your right. From the Meridian, MS area take 20/59 North to the Eutaw/Aliceville Exit 40. At the top of the ramp take a left on 14 west. Go 5 miles where you will have to turn right to remain on Hwy 14 west. If you go straight at this point you will get lost. Go 11 miles where you will see catfish ponds on your left. The Shark Tooth Creek sign and drive are on your right. 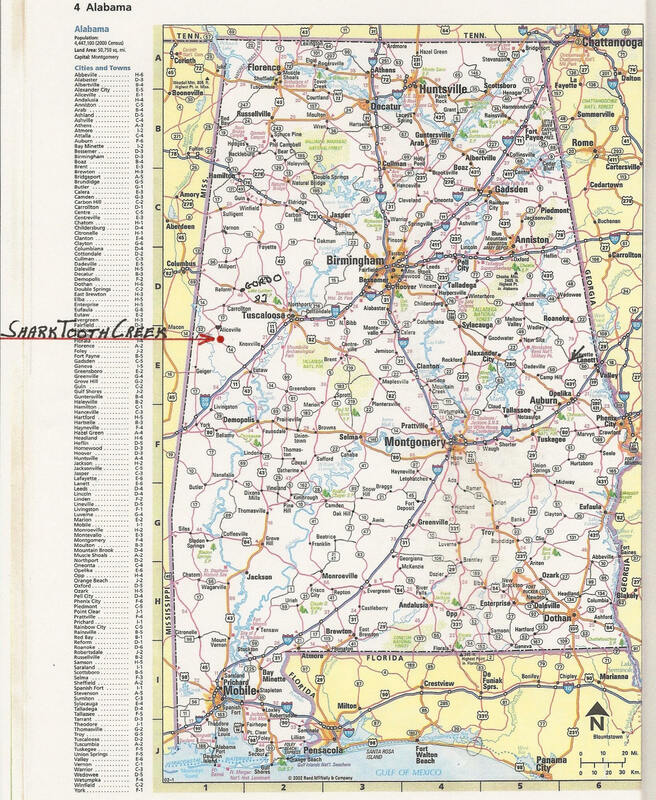 From the Mobile and South Alabama area, take Hwy 43 north to Eutaw, AL where you will take a left on Hwy 14 west. Follow Hwy 14 west through Eutaw. Go about 2 miles and you will cross over the I 20/59 bridge. From this point Go 5 miles where you will have to turn right to remain on Hwy 14 west. If you go straight at this point you will get lost. Go 11 miles where you will see catfish ponds on your left. The Shark Tooth Creek sign and drive are on your right. From the Columbus, MS area, take MS Hwy 69 south. At the state line that turns into AL Hwy 14 east. Continue on 14 east through Pickensville. From the Brooksville, MS area, take MS Hwy 388 east over to Pickensville and take a right on Hwy 14 east. Continue on 14 east through Aliceville. From Aliceville, go about 8 miles where you will see the Shark Tooth Creek sign and drive on your left. From the Hamilton/Winfield area take Hwy 17 south to Aliceville. From Aliceville take Hwy 14 east.. Go about 8 miles where you will see the Shark Tooth Creek sign and drive on your left,.